The day dawned normally today, but seemed gloomier. After the morning ablutions, booted my computer and understood the reason for my melancholy immediately. My friend Rohan Joshi from Bangalore had sent some bad news -- "Manna Dey no more". I immediately rushed to the T V with the forlorn hope that the news may be false. But this rarely happens. The News channel confirmed the news. The mind went into a turmoil. All the images of this gentleman of gentlemen flashed through the mind. Manna Dey aka Prabodhchandra Dey, who made his début as a playback singer in 'Tamanna' in 1942, was a worthy nephew of a great singer Kishen Chandra Dey (more popularly known as K C Dey). A graduate and sports-lover, Mannada as he was fondly called recorded his first song under the aegis of his Uncle K C Dey - a duet with Suraiya - Jago ayee usha pochey boley jago. It was an instant hit and there was no turning back. He sang with Meena Kapoor, Suraiya, Umadevi (Tun Tun), Rajkumari and many others, including many solo songs. 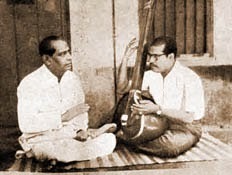 He sang for Anil Biswas, Jaffer Khurshid, Pandit Indra and others. Then in 1950, he sang for 'Mashaal', under the tutelage of Sachin Dev Burman, the famous "Upar gagan vishal". This made him a household name all over India. There was no looking back after that. Manna Dey was sought after by all composers - Anil Biswas, Khemchand Prakash, S K Pal, Shankarro Vyas, S D Burman, and others. In 1952 he sang for a Marathi and Bengali movie by the same name - 'Amar Bhupali' which again became an instant hit. In 1953, Salil Choudhary made him even more popular - with the songs from 'Do bigha zameen’. Both the songs with Lata Mangeshkar 1-' Hariyala sawan dhol bajata aaya' and 2- 'Dharti kahe pukar ke..... mausam beeta jay' turned out to be chartbusters. Dharti kahe pukar ke was also a part of the first annual Binaca Geetmala program of 1953. However his association with Raj Kapoor and Shankar-Jaikishen which began during 'Awara' [remember-'Tere bina aag ye chandani'] took him to another level with 'Boot Polish' in 1954. Thereafter Shankar-Jaikishen / Raj Kapoor / Manna Dey worked together in many films, Shree 420, Chori Chori to name a few. His most productive years in Hindi were from 1954 to 1959, wherein he recorded more than 200 songs. Music Directors sought him out - Naushad, K.Dutta, Vasant Pawar & Ram Kadam, Vasant Desai, Ravi, S.K.Pal, Avinash Vyas, S. N. Tripathi, C Ramchandra, Husanlal Bhagatram, , O. P. Nayyar, G.Ramanathan, S D Burman,Shankar Jaikishen, Ghulam Mohhammed, Bipin Dutta, Rabin Banerjee, Roshan, Sapan Jagmohan from 1954 to 1968. He also sang for New Music Directors of the 60's Kalyanji-Anandji, Laxmikant-Pyarelal and R D Burman [who made him sing westernised tune songs - AaoTwist kare and Pyar karta ja]. Can we ever forget Manna Dey songs like "Lapak Jhapak Tu Aa Re" from Boot Polish(1954), Tu Pyar Ka Sagar Hai" from Seema(1955), "Yeh Kahani Hai Diye Aur Toofan Ki" from Toofan Aur Diya (1956) composed by Vasant Desai, "Humdum Se Gaye" from Manzil (1960), "Aye Mere Pyare Watan" from Kabuliwala (1961), "Laga Chunari Mein Daag" from Dil Hi Toh Hai (1963), classical songs like "Sur Na Saje" from Basant Bahar (1956), "Kaun Aya Mere Mann" from Dekh Kabira Roya (1957), "Pucho Na Kaise Maine Rain" from Meri Surat Teri Aankhen (1963), "Jhanak Jhanak Tore Baje Payalia" from Mere Huzoor (1965); folk based songs like "Kisi Chilman Se" from Baat Ek Raat Ki (1962), "Ae Meri Zohra Jabeen" from Waqt (1965), "Chalat Musafir Moh Liya" from Teesri Kasam (1967), "Aao Aao Sawariya", and duets with Lata like "Masti Bhara Yeh Sama" from Parvarish(1958), "Nain Mile Chain Kahan" from Basant Bahar (1956), "Kehdoji Kehdo Chupaona Pyar" from Kismat Ka Khel (1956), "Tum Gagan Ke Chandrama" from Sati Savitri (1964), "Dil Ki Girah" from Raat Aur Din (1966), "Chunari Sambhal Gori" from Baharon Ke Sapne in 1967, were chartbusters in their respective year of release. 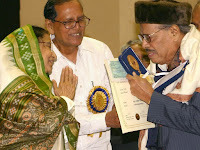 Manna Dey must be given credit for popularising classical based solo and duet songs to the masses like the duet with Lata – "Pritam Daras Dikhao" from Chacha Zindabad . His rendition of "Kasame Vaade Pyar" from Upkar (1967) pictured on Pran and composed by Kalyanji Anandji won accolades for Dey. It was also significant in Pran’s career as he began to do positive roles after Upkaar. 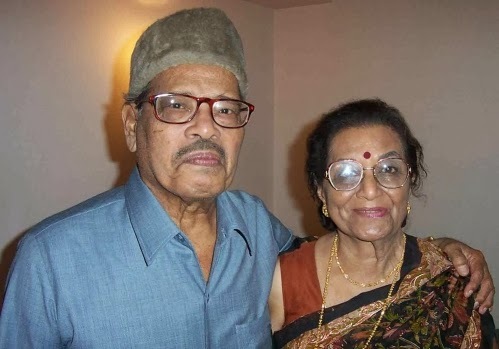 Manna Dey recorded many duets with Rafi, Asha Bhonsle, Lata, Suman Kalyanpur etc. 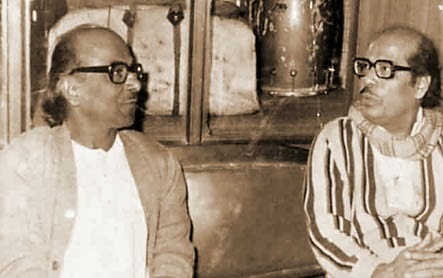 Manna Dey got a fresh lease of life when Rajesh Khanna asked music composers to record some songs in his voice to be picturized on him- Anand, Bawarchi are examples of this. This is not an attempt to cover the entire life of Mannada. It is beyond my capacity. I have just tried to highlight a few of his many achievements. We all at HindiGeetMala are so very thankful to Dilip Apte sir for writing this beautifully written tribute to Manna Dey. Looking forward for more and more post by him on this very new blog about Hindi songs, lyrics, movies and people associated with them. Wah Sajnjay- excellent job. You have uploaded 2 very appropriate songs. One which made him a household name and one which converted a villain into a character actor par excellence . Who said that Manna Da is no more ? He is all around us with his immortal contributions to our society and live within our hearts, thanks to Apte Sir for your kind post. manna deyji india ka sirmor legendry singer the.bharat ka ratna the. really i miss u. Great Singer. We ca'nt forget his contribution in our life as we are grown up in his shadow. Have heard him live in his Nineties at Renukoot, UP , he was superb even at that age inspite of long travel & being tired, he sang many of his very popular songs with great ease. Apte sab, yours is a wonderful blog for all music lovers, thanks. 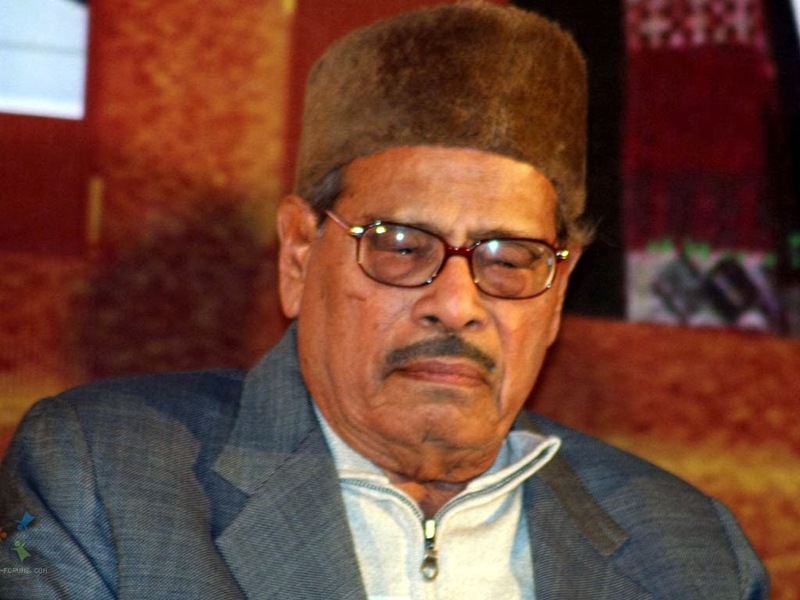 You have not mentioned about numerous non-filmi songs beautifully sung by Shri manna dey sab like nathali se toota moti re, meri bhi ek mumtaz thi etc , all penned by Madhukar Rajasthani. Great Master. No doubt he was a good classical song singer, but not versatile as Rafi, he has something missing in his voice, may be melody, the charisma, something which touches the heart, I am convinced he was not a playback material. This is an unfair comment for a legendary and very versatile singer. There are many instances when given an opportunity, he even surpassed his more illustrious contemporaries, only to be ignored thereafter. The fact remains that he was a singer with immense possibilities but rarely utilised to his potential. Even Shankar of Shankar Jaikishan fame lamented at the fag end of his carrier, "We have wasted him" and Lata Mangeshkar commented after his death, "He didn't get his due in comparison with the way he could sing". These comments from the stalwarts of music industry speak for themsilves. Manna Dey is a singer par excellence. Poochu na kise & bate hi NATO kya rises emotions beyond expression. He is immortal. Samjun, excellent,,no word's to express feeling. Thanks to dear Apte ji for nice article on MannaDa, since my childhood I am singing MannaDa semiclassical songs and always win 1st price "Laga Chunari me Dag". Still @ the age of 70 today I tried the same song on farmayish.